Sip kava with the chief at Leweton Cultural Village: If you’re on a tight schedule, spending the better part of a day at the Leweton Custom and Cultural Village is a great way to experience some of Vanuatu’s oldest customs and traditions. Tribal greetings, custom song and dance are all part of the experience, as well as demonstrations in basket weaving, traditional food and kava making. For first timers though, beware Vanuatu kava is the strongest in the South Pacific so do pace yourself. Run by the local community, Leweton Cultural Village is open daily and located just outside of Luganville town. Beach hop around the Santo: Many say the best beaches in Vanuatu are found on Santo…and we’re inclined to agree. Soft white sand and Bombay Sapphire blue waters seem to be the norm around this neck or the woods, but there are a few star performers that deserve special mention. Champagne Beach for instance is the stuff of tropical holiday dreams; a horseshoe of palm-fringed white sand that is so fine that when it meets the crystal blue water it could be mistaken for milk. It’s the kind of setting that could challenge some of the world’s most beautiful beaches, and more often than not, you’ll have it all to yourself. Unless a cruise ship has docked. And although not strictly on Santo, it’s worth the 10-minute boat ride across to Aore Beach which is a snorkeler’s delight. And, if you can’t bear to leave Aore Island Resort is as lovely as its beaches surrounds. Scuba dive the SS President Coolidge: Considered one of the largest and most accessible ship wrecks in the world for divers, the SS President Coolidge is a bucket-list dive. The luxury cruise ship sank in 1942 after hitting a mine during WWII with 5,000 troops on board, but miraculously all but two escaped. She’s now declared a Marine Reserve and you can swim through her old corridors and stairwells, descending to depths up to 60 metres. Overall The Coolidge is over 200 meters long and mostly intact, so even after 20 dives you can expect more facets of the wreck to explore. 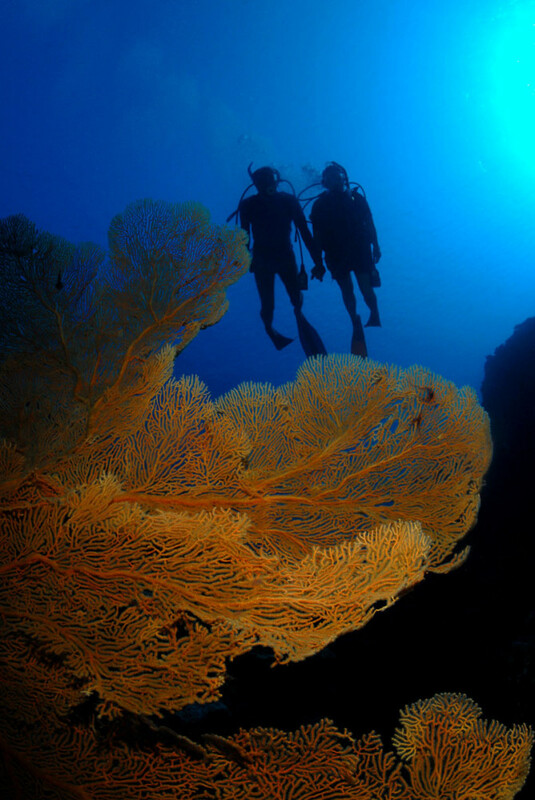 Of course, Santo offers many more dive sites beyond Coolidge, with a multitude of WWII wreckage sites and gorgeous coral reefs surrounding the island. Bathe in a blue hole: Thanks to a mix of volcanic rock, limestone caves and a high mountain range, the east coast of Santo is sprinkled with a handful of mesmerising blue holes. As you might suspect, these deep, freshwater swimming holes get their name from the luminous jellybean-blue hue of the water. 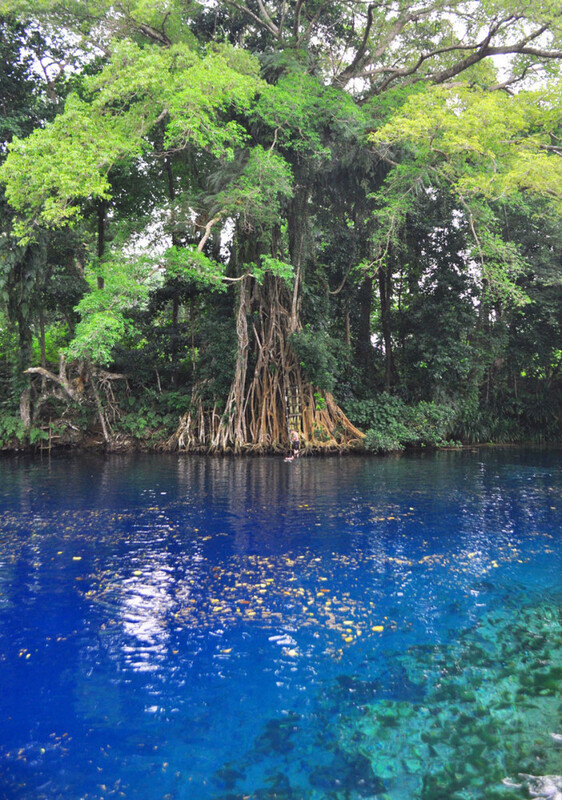 But as well as being a popular sightseeing landmark for travellers and kayakers alike, blue holes are also home to a number of rare plants and animals. There are two major blue holes to pencil into your itinerary, Matevulu Blue Hole (best reached via a kayaking tour along Riri River so you can see the water change colour as you get closer), and Nanda Blue Hole, located half way between Luganville and Champagne Beach along the East Coast Road at Natawa. Trek through Millennium Cave: For those who aren’t afraid of a bit of rough and tumble, tours through Vanuatu’s largest cave reward trekkers with some spectacular sights. Equipped with atleast a medium level of fitness, the experience takes you through tropical forest, scrambling over rocks and boulders, and through Millennium Cave itself which is home to bats and towering rock faces sculptured by the river over time. There’s also opportunity to swim in waterfalls and take time out for a picnic amid the tropical setting. Thanks to a mix of volcanic rock, limestone caves and a high mountain range, the east coast of Santo is sprinkled with a handful of mesmerising blue holes. As you might suspect, these deep, freshwater swimming holes get their name from the luminous jellybean-blue hue of the water. 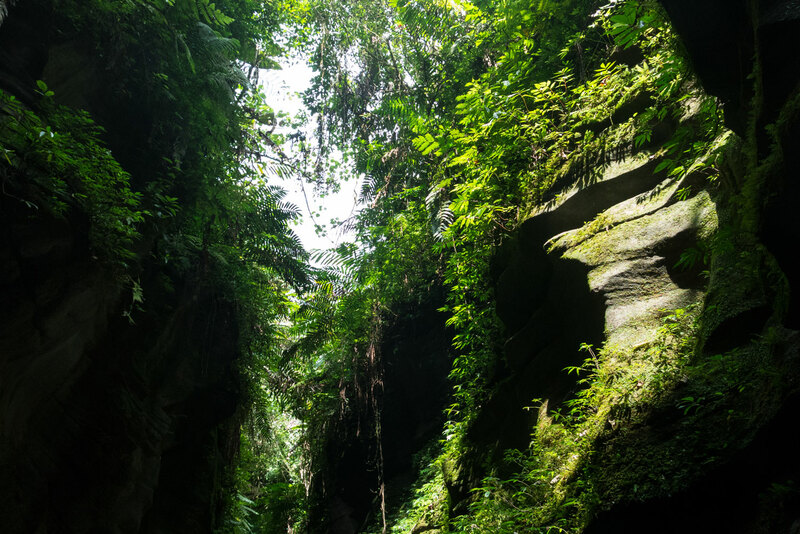 But as well as being a popular sightseeing landmark for travellers and kayakers alike, blue holes are also home to a number of rare plants and animals. There are two major blue holes to pencil into your itinerary, Matevulu Blue Hole (best reached via a kayaking tour along Riri River so you can see the water change colour as you get closer), and Nanda Blue Hole, located half way between Luganville and Champagne Beach along the East Coast Road at Natawa. If you’re on a tight schedule, spending the better part of a day at the Leweton Custom & Cultural Village is a great way to experience some of Vanuatu’s oldest customs and traditions. Tribal greetings, custom song and dance are all part of the experience, as well as demonstrations in basket weaving, traditional food and kava making. 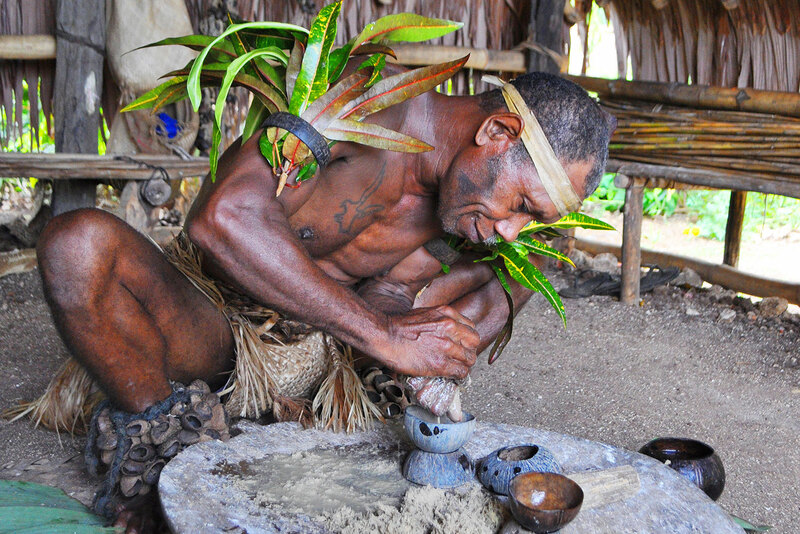 For first timers though, beware Vanuatu kava is the strongest in the South Pacific so do pace yourself. Run by the local community, Leweton Cultural Village is open daily and located just outside of Luganville town. Considered one of the largest and most accessible ship wrecks in the world for divers, the SS President Coolidge is a bucket-list dive. The luxury cruise ship sank in 1942 after hitting a mine during WWII with 5,000 troops on board, but miraculously all but two escaped. She’s now declared a Marine Reserve and you can swim through her old corridors and stairwells, descending to depths up to 60 metres. Overall The Coolidge is over 200 meters long and mostly intact, so even after 20 dives you can expect more facets of the wreck to explore. Of course, Santo offers many more dive sites beyond Coolidge, with a multitude of WWII wreckage sites and gorgeous coral reefs surrounding the island. For those who aren’t afraid of a bit of rough and tumble, tours through Vanuatu’s largest cave reward trekkers with some spectacular sights. Equipped with atleast a medium level of fitness, the experience takes you through tropical forest, scrambling over rocks and boulders, and through Millennium Cave itself which is home to bats and towering rock faces sculptured by the river over time. There’s also opportunity to swim in waterfalls and take time out for a picnic amid the tropical setting. 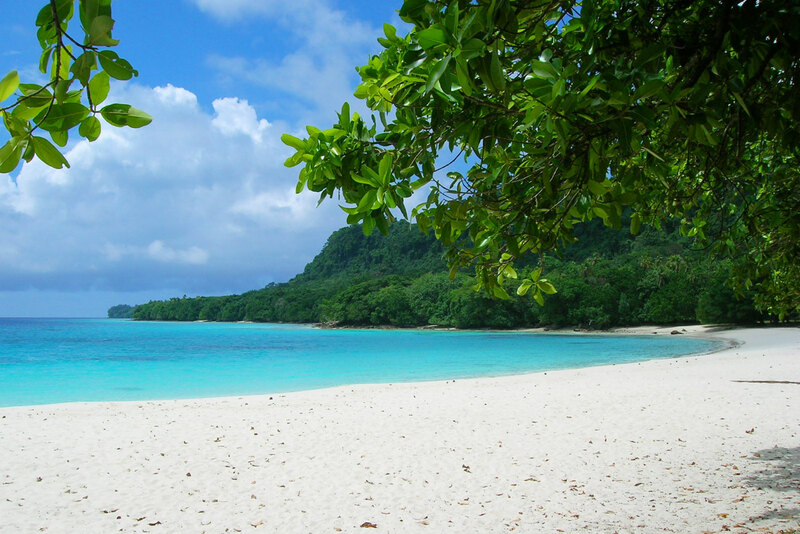 Many say the best beaches in Vanuatu are found on Santo…and we’re inclined to agree. Soft white sand and Bombay Sapphire blue waters seem to be the norm around this neck or the woods, but there are a few star performers that deserve special mention. Champagne Beach for instance is the stuff of tropical holiday dreams; a horseshoe of palm-fringed white sand that is so fine that when it meets the crystal blue water it could be mistaken for milk. It’s the kind of setting that could challenge some of the world’s most beautiful beaches, and more often than not, you’ll have it all to yourself. Unless a cruise ship has docked. And although not strictly on Santo, it’s worth the 10-minute boat ride across to Aore Beach which is a snorkeler’s delight. And, if you can’t bear to leave Aore Island Resort is as lovely as its beaches surrounds. Docking into Santo via P&O and would love to have some idea on what to do for the day.. Will be myself and my boyfriend both 18.. Thanks for the help.